President Moon Jae-in on Thursday paid a courtesy call on Pope Francis at the Vatican, a symbol of peace and reconciliation in the world. It is his first courtesy visit to a pope since taking office, and Moon is the fifth South Korean president to pay a courtesy visit to a pope in the Vatican. The South Korean president expressed his deep gratitude for the historic meeting with Pope Francis, who has been expressing profound interest and support for peace on the Korean Peninsula. In response, Pope Francis stressed the sense of “brotherhood” of the two Koreas and said he hopes the Koreas continue their efforts for reconciliation and establishment of peace. “I thank you for your warm welcome and taking your time during General Assembly of the Synod of bishops. Also, I thank you for offering a message of peace and reconciliation at every critical juncture on the Korean Peninsula,” Moon said. 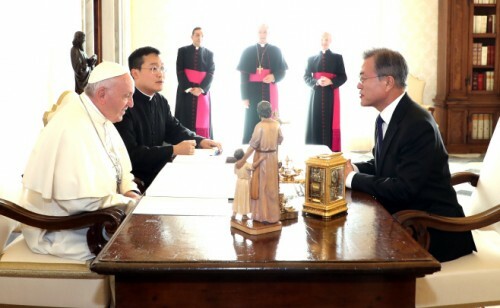 After explaining the South Korean government’s recent efforts to establish peace on the Korean Peninsula, Moon asked the Pope’s continued prayers and support for peace, reconciliation and co-prosperity of the peninsula. Moon and the pope met behind closed doors in the Apostolic Palace, with South Korean priest Han Hyun-taek serving as an interpreter, shortly after noon local time. After the meeting, the pope and the South Korean president exchanged gifts. Moon and his wife Kim Jung-sook took a commemorative picture with the pope and his entourage. Following the meeting with the pope, Moon held a separate meeting with the Vatican’s Secretary of State Pietro Parolin. Moon briefed Parolin on outcome of the papal meeting, and called for Vatican’s continued interest and support for peace settlement on the Korean Peninsula as well as strengthened cooperation between South Korea and Vatican. After wrapping up his three-day official visit to Italy and the Vatican, Moon headed to Brussels on Thursday to attend the 12th Asia-Europe Meeting (ASEM) summit. Moon attended a Gala Dinner of the ASEM summit hosted by EU Council President Donald Tusk on Thursday evening. During the gala dinner at the Royal Museums of Art and History, Moon expressed his gratitude to Tusk for his warm welcome and preparation of hosting the summit. Moon is scheduled to attend the ASEM summit and hold bilateral talks with the leaders of Britain, Germany and Thailand on Friday.